You are here: Home / News / Residential Plumbing / A Tankless Water Heater Is More Efficient. Save Money With A Tankless Water Heater! A tankless water heater is the perfect option for homeowners committed to controlling their energy expenditures. Traditional water heaters store up to 50 gallons of heated water, meaning you’re using gas or electricity to keep those 50 gallons warm, even when you’re not using them. Tankless water heaters have been perfected in Europe over the decades where the technology is now standard. American homes and businesses are finally adopting this highly efficient system of heating water. At A-Able Plumbing, we believe it’s the perfect option for homeowners in Virginia. Save Money. Tankless water heaters are more energy efficient than traditional water heaters. You save money over the life of the unit. Lasts Longer. Tankless water heaters are reported to last twice as long as traditional units. Smaller Profile. Because tankless water heaters heat water on demand, they are considerably smaller than traditional units. Since tankless water heaters require less space for installation, you will have more space to store things in that utility room! Less Waste. Typical tankless water heaters provide up to 3 gallons of hot water, per minute. You’ll waste less water waiting for it to heat up. 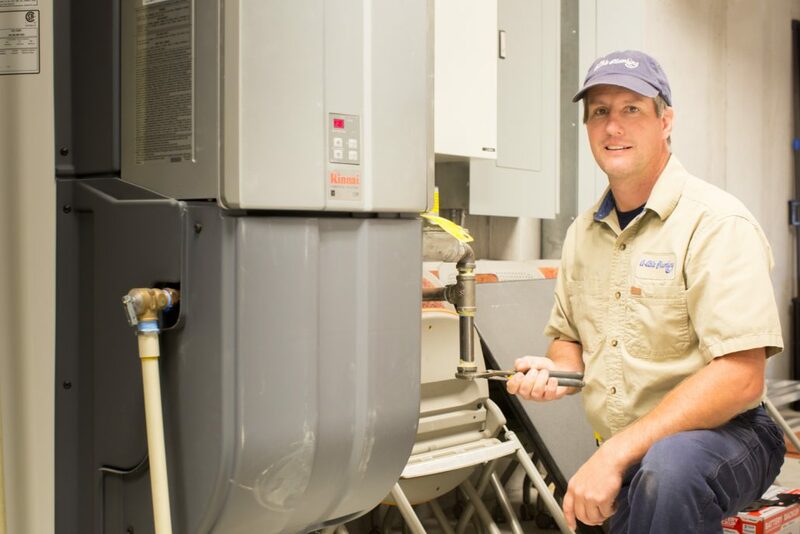 Consider the benefits of a tankless water heater when you’re building or renovating your home. A-Able Plumbing Installs Tankless Water Heaters. Since 1988, A-Able Plumbing has provided innovative and experienced plumbing solutions to homeowners in Virginia. Our team of qualified plumbers bid and design systems geared towards the specifications of the project and the customer’s parameters. When you choose A-Able Plumbing, you’re choosing a local business committed to exemplary service and quality installs.